Are You Practicing Witchcraft Without Knowing It? Subtitle: Most parents relax when they take their beloved children into a toy store, instinctively believing that nothing within that store can hurt their children in any way, shape, or form. Little do they realize that much Witchcraft is woven in and through many of the toys on the shelves. But, we discovered a book which teaches elementary Witchcraft! Actual Witchcraft. Witchcraft Teaching Book Found In Toys-R-Us! Kids are safe in a toy store, right? Wrong. In 1986, as I began studying the New Age Movement and Witchcraft, I learned to my horror that toys are steeped in Witchcraft. At the time, I was the Boys Toy Buyer for a chain called "Children's Palace" (patterned after Toys-R-Us) and I had learned that some of the most popular toys which I had been buying and selling by the tens of thousands were steeped in actual Witchcraft. Examples of these type of occult-based toys were Masters of the Universe, My Little Pony (Unicorns), Smurfs, and Dungeons and Dragons, to name just a few. I was horrified and left the company in January, 1987. God guided me through some really tough economic times, but He was working through me to develop what became Cutting Edge Ministries. Why would the Illuminati be so interested in polluting the minds and hearts of our young children? The planners for the New World Order have intentionally targeted our precious children with the boldly-stated goal of changing their value systems. After all, the children of today become the parents, teachers, and leaders of the nation tomorrow. If their young minds can be captured for Satan today, the nation will belong to him tomorrow. This frightening possibility brings to mind Jesus' stern warning that anyone who causes a little child to lose their faith in Him would suffer eternal punishment. (Luke 17:2). In the seminar, we show that this conditioning is now occurring in many areas of our society, so that no one can be fully insulated against it. However, on today's program, we will look at the area of children's toys and TV advertising to see how our children are currently being programmed to accept the values of the New World Order. Now, 21 years later, toy stores have come so far in implanting the values and attitudes of Witchcraft in our children's minds that I walked into a Toys-R-Us some months ago, to see an actual book on elementary Witchcraft on an end cap with a variety of book titles! I was horrified as I leafed through the book. 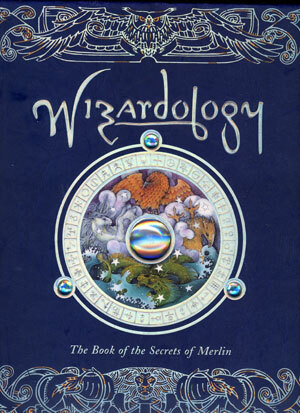 Before we go any further, let us examine the central portion of the front cover of this book, "Wizardology: The Book of the Secrets of Merlin". 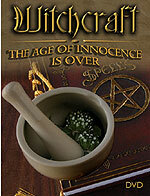 The following elements of Witchcraft are present on this front cover. 1) Crystal Ball -- in the center. All through this book, you will read about how crystal balls are used in a variety of ways. 2) Three Crystals Around The Round World -- these three crystals are placed in such a manner that straight lines drawn between them form the coveted magical geometric shape of the Triangle. In the occult world, a triangle is seen as a spiritual object, as it represents the Pagan Trinity, i.e., Satan, Antichrist and the False Prophet. 4) Around the outside of the round world are numerous symbols of the occult, including signs of the Zodiac. Now, let us open the book to discover the horrors within. Remember, this book teaches elementary Witchcraft, designed to stimulate the young mind of your child to become interested in Witchcraft so they will pursue more advanced principles and practices of the occult world as they get older. We shall report on the material being taught inside the book by topic. This book teaches children that they should have a familiar spirit -- and it really calls them by that name! Some examples -- note that this book has no page numbers. "To call my familiar Harpier, flap your arms, hoot three times like and owl, and think of field mice" - Below this sentence, a wise-looking wizard is pictured in contemplation, with long flowing white hair and mustache. His familiar, an Owl, is sitting at his elbow. "Were you to have been the usual sort of apprentice, you would have spent nearly all of your time here: being punished for your foolishness, chastized for your laziness, laundering robes, stirring cauldrons, preparing potions, researching spells, taking care of familiars, and polishing wands. In Chapter VI entitled, "A Wizard's Loyal Familiars - There is a great benefit to every wizard in keeping a fish, bird, or other creature as a familiar or assistant. There is no better way for a wizard to learn about the natural worlds of the earth, air and sea." Witches believe that familiar spirits inhabit certain earth creatures. DOGS -- "Dogs are faithful guardians and find lost objects through their magical sense of smell." 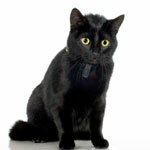 CATS -- "With their excellent night vision and independent natures, cats can visit many places unnoticed". TOADS -- "Cunning infiltrators of every bog and marsh, toads are small enough to carry with you." FISH -- "A fish familiar, be it sea - or fresh-water - can be useful in making aquatic discoveries"
OWLS -- "These nocturnal hooters are very wise and see a great deal without needing to interfere." HEDGEHOG -- No writeup is given. The Hedgehog is merely pictured with the owl and the cat in a picture above the words, "My Familiars". "The chief benefit of having a familiar is that animals can easily see spirits, such as fairies, elves, and gnomes, who rightly hide themselves from foolish humans. But before you even consider obtaining a familiar of your own, you must learn how to take care of it properly and to train it correctly." At this point on the page, there is a whimsical picture of a young boy lying in a meadow, intently gazing upon a toad resting on a stump. Below this picture is the headline, "Finding A Familiar". I ask you once, I ask you twice, but more than twice would not be nice. With a wag, a croak, or mew, pray tell me now what you will do. Will you be my familiar? Give your answer to me! At this point, the child is told to choose a new "magical name" for his/her new familiar spirit. Now I'll give you a new name, secret as a hidden flame. It's a secret none shall see -- only we two: you and me. With my hand I make the spell. Your new name to none I'll tell. "Here, cry out the name. The creature has now become your familiar. This is a very important relationship and from now on, you must do everything in your power to help and heal the animal should it ever require your assistance." In the Harry Potter books, familiars were scattered throughout each of the volumes. The most common types of animals which were familiar spirits in Harry Potter were owls, cats, and "magical creatures". The Bible is very clear that God's believers were NOT to have anything to do with familiar spirits and nothing to do with anyone who has a familiar. In the last verse, God decrees that the person who has a familiar spirit should be put to death by stoning! In other words, God ordered the Jewish government to execute persons who have familiar spirits. Therefore, it is a very big deal when a book like this one is written in such a way as to encourage children to want familiar spirits and to become comfortable with them. And, when you realize that this book is specifically written for young children and is being sold in toy stores like "Toys-R-Us", you must realize how angry God is with this nation. A New Age author once wrote that the New Age Christ cannot arise until and unless a substantial proportion of them are pre-conditioned to accept the values and the attitudes of the Christ. This book, sold in toy stores, certainly is aimed at pre-conditioning precious children to accept the value system of Antichrist. Is this pre-conditioning of young people the reason that Harry Potter books sold so very well? Leviticus 20:6; 1 Samuel 28:3, 7-9; 2 Kings 21:6; 23:24; 1 Chronicles 10:13; 2 Chronicles 33:6; Isaiah 8:19; 19:3; 29:4. Since this "Book of Merlin" is a "White Magic" book -- teaching children to use the powers of the occult only for the good of mankind -- it warns against evil spirits and in the process, reveals some truth known only to those trained in Witchcraft. Let us first examine the admonition to only use the powers of Satanism for good. "While it can be useful to be of mixed fairy-human blood, like myself, anyone can become a wizard. All that is needed is a commitment to follow these simple rules; to live like a hermit, to work like a plough horse and to give up all worldly pleasures in order to further the good of nature and humankind. As masters of the secret knowledge of fairies, elves and a whole host of other spirits invisible to human sight, the wizard holds a position of power that must be used only for good." Now, let us review his warnings about wicked spirits and how much danger they pose to "good witches". "A wizard works with the assistance of good fairies, elves and other spirits. He must beware of any dealings with the wicked imps or sprites. These wayward beings delight more in the way of mischief than simply curdling the milk, scaring the chickens, or turning the butter sour." Notice that, through giving these warnings, the author of "The Book of Merlin" validates both the existence of evil spirits and their malevolent power. The Wand -- ... a wand is a precision tool. It must be carefully constructed from the kind of wood associated with the spell to be performed and may also need the addition of a gemstone, feather, or other element ... Gestures with hand, wand, or staff serve to focus magical force." This last sentence is entirely correct. A witch or wizard uses a wand for exactly this purpose, i.e., to focus the occult force exactly as the specific ritual stipulates. "Spellcraft is the basis for all magical endeavor. Spells can be used on their own, or else to charge items such as wands, amulets and potions. But the apprentice must always remember that spells are highly dangerous. The words must be repeated exactly;the magic symbols must be drawn with complete accuracy. On several occasions, I have had to rescue feeble-minded apprentices who did not realize that if a spell can go wrong, it will go wrong because even the good fairies and elves who help us detest being made to do our spells." This paragraph is precisely correct on several points. 1) The words of a ritual do have to be repeated exactly. In "Catholicism: White Sepulcher Christianity" DVD, we demonstrate that Roman Catholicism is nothing more, nor less, than a practice of White Magic Witchcraft. In a Mass -- and there a many of them -- the priest is required to repeat the words exactly. 2) Symbols must be drawn with absolute accuracy. The witch or wizard can be killed by the demonic spirit being summoned if a mistake is made in either repeating the words exactly or in drawing the symbols incorrectly. 3) The demonic spirits DO, indeed, detest having to perform the deed which the wizard or witch is requiring them to perform. While being bound by Satan's rules in serving a human being, they are allowed to wreak havoc and even death if the wizard does not do the ritual exactly correct and if the symbols are drawn incorrectly. Witches and wizards that cast spells "peep" and "mutter" their incantations, so we know that God is speaking here of "casting spells". God forbids the casting of spells in Isaiah 8:19, "And when they shall say unto you, Seek unto them that have familiar spirits, and unto wizards that peep, and that mutter: should not a people seek unto their God?" 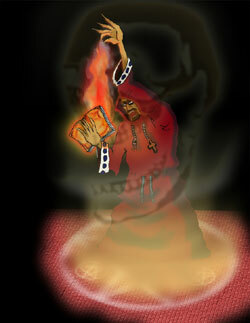 Before speaking about specific spells, the wizard addresses the issue of the protective circle. "Vivienne's Circle -- This spell protects you from all magical attacks as long as you do not step outside of a circle you cast around you with salt. See the four names Gladde, Larfor, Jaypes, and Pranxtor glowing around the circle, imagining each one as a powerful spirit who will protect you." I am safe from one and all." At this point, the wizard pronounces the exact spell he wants to cast; for obvious reasons, we do not list that spell/curse here, but it is in this book for your child to read and to be influenced by its spirit from the Abyss. However, the point I want to make is that this teaching that a circle provides protection to everyone inside it is entirely correct. In many of the spells, a witch will draw a 9-foot circle on the ground or the floor and then will step inside to draw either a hexagram or a pentagram. Once the circle is thus prepared, the witch and every member of the coven present will get inside the circle to get ready for the demon to appear to carry out the specific spell. Doc Marquis, former Black Magick Witch, explains that the major reason for members of the coven to get into the circle is for their personal protection . Marquis explains that, even as the specified demon is required by Satan's present rules to respond to, and serve, the witch who has properly carried out the ritual, he hates all humans because we are created in the "image of God". One time, Doc recalls, the demon whom the witch conjured into this dimension during a particular destruction spell was so hideously ugly that one of the coven members gasped, stepped backward, and then allowed one of his feet to step over the line; immediately, the demon shrieked and flew across the circle to physically annihilate that poor coven member. Did you notice that LaVey both confirms that demons are the power behind the spell, but he also tells us that the "spontaneous" bleeding of a person which Catholics call "stigmata" is also caused by demons? Demons are the power behind any spell and in true Witchcraft, demons have to be conjured into this dimension in order for the spell to work. Roman Catholic statutes are constantly bleeding, a sign which adherents take to come from God or Jesus; in reality, Stigmata is a common demonic activity. Even Buddhist statues bleed, just as their Roman Catholic counterparts! "CRYSTAL BALL - A crystal ball, magical mirror, or other scrying device will prove invaluable in ascertaining what the future may hold and can also be useful in communicating with other wizards over large distances." 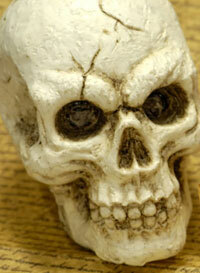 Reading Crystal Balls is an ancient form of Divination [foretelling the future by contacting demonic spirits]. Even my Tormont Webster's Illustrated Dictionary gets this fact right: Divination -- 'The art or act of foretelling events or revealing occult knowledge from augury or ... supernatural agency." In this area of Crystal Ball reading, I now know why God so powerfully moved me to buy a book on this subject while perusing Kessinger's Freemasonry and Occult Bookstore online some months ago. While I was certainly not looking for information on Crystal Ball Gazing at the time, a burning desire to purchase this book took hold of me, and would not let me go until I had bought the book. Now, I know why God so powerfully moved me; He knew I would need it for this article. This book is quite ancient, and is one of the formerly very secret occult books published by Freemasonry publishing houses. The book is called Crystal Gazing: A Study In The History, Distribution, Theory, and Practice Of Scrying , by Theodore Besterman, reprinted by Kessinger's Freemason and Occult Bookstore. No date of publication is given, but the very fact that this archaic term, Scrying , is used to describe Crystal Ball Gazing, among other forms of divination, is indicative that the book is over 100 years old. This description of supernatural demonic beings is quite enlightening when you examine a dictionary for the meanings of these beings which Sir Walter Scott said were conjured up into our physical dimension by Crystal Ball Gazing. Fairy -- is defined as "tiny supernatural beings in human form". Salamander -- is defined as "an elemental spirit supposed to live in fire"
"Crystallomancy is a method of divination by the crystal which gave its answers whether pyramidal, cylindrical, or of any other manufactured shape of crystal. Or else it was done by means of pieces or kinds of crystal enclosed in rings, or else enclosed in some vase, and cylindrical or oval in shape, in which the devil makes it seem as though he were in it." [Page 3] Did you catch that last phrase? the "devil" makes his presence known during Crystal Ball Gazing! The Druids were one of the most evil, most insidious, and most Satanic groups in world history. They were completely given over to the most black arts of the Black Magick, and practiced human sacrifice continuously. For this reason, the Illuminati has adopted the style of witchcraft of the Druids. Therefore, the Witchcraft of Antichrist will be identical to that of the Druids. It seems to me that Satan would like the children of the world to adopt this type of Black Magick Witchcraft prior to the appearance of Antichrist. Harry Potter books are drawing the children into this type of Black Magick Witchcraft; Chuck Colson's false assurance is drawing in children from Christian parents! Astrology [Page 48] -- God absolutely forbids Astrology in Deuteronomy 18:10, "There shall not be found among you any one ... that useth divination, or an observer of times, or an enchanter, or a witch ..." Then, in verse 12, God declares such practices an abomination before Him. An Astrologer is "an observer of times" but Astrology also divines the future. Automatic Writing [Page 126] -- This practice is insidious, and exceedingly demonic. Automatic Writing occurs when a demon takes full possession of the body and mind of the medium, and begins to write a message through her, or him. During this time, the medium has no idea what is being written, even though the writing is usually coming through her hand or typewriter with incredible speed. She reads the writing only after the demon has released her mind and body from his control, returning her to a normal state. Most New Age and New World Order writing expounding various parts of the Plan, is Automatic Writing. Now, we know that divination through Crystal Ball Gazing can lead to Automatic Writing! Demonic Rapping [Page 129] -- When a medium has conjured up demonic spirits, she often hears some kind of a rapping phenomenon from the demons. As the author of this occult book states, "The next case which I shall give is a curious one as involving (1) raps, (2) a crystal-vision, (3) an apparition seen by two persons ..." Once again, we see how dangerous Crystal-gazing is, and how wide a direct door it opens into the demonic world. Demonic Hauntings [Page 130-1] -- The practice of of Crystal-gazing can lead to demonic hauntings, being able to see the spirits which are haunting a particular place. When a person gives themselves up to the practice of Crystal-gazing, they are opening themselves up to the potential of demonic haunting of their house of dwelling! How would you like your house haunted simply because your child was reading Harry Potter? Such activity gives demonic spirits the legal right to come into your house. Mr. Colson, are you listening? Multiple Personalities [Page 131] -- Of all the activities associated with Crystal-gazing, the idea that it can cause Multiple Personalities is one of the most frightening. However, you need to be aware that a Satanist deliberately undergoes rituals which are specifically designed to create multiple personalities within their mind. We normal people think that having multiple personalities is a devastating mental illness, which is truly is; however, Satanists look upon multiple personalities as very desirable and seek such a mental condition for themselves and for their children. Now, we discover that Crystal-gazing can lead to this type of mental disorder! Mr. Colson, do you still think Christian parents should allow their children to learn about Crystal-ball gazing through Harry Potter? Telepathy [Page 141] -- Witches energetically seek out the occult ability of telepathy, defined as communicating by means other than normal speech. Now, we discover from this occult author, that such Satanic ability of telepathy is possible for a person participating in Crystal-ball Gazing! Contact With Spirit Guides -- Guiding Spirits [P. 156-160] Extensive use of Crystal-ball Gazing can result in contact with Guiding Spirits. These spirits come into a person's mind and body usually through occult meditation, assuming the role of a Familiar Spirit. Such a Guiding Spirit gives daily advice on all manner of situations, and almost always gains such control over a person's thinking patterns and behaviors that the person literally cannot function without them. The Bible calls this type of spirit a possessing spirit; in other words, a person who has a Guiding Spirit is demon-possessed! A person can become demon-possessed by participating in Crystal-ball Gazing! Sent forth a sound half-whistle and half-hiss. In frame as diamond bright, yet black as jet. This poem illustrates that demonic intervention is absolutely essential in making divination work. In this case, disembodied hands came into the crystal, "Armless and bodyless", to give the answer in the crystal ball. This same demonic intervention is what makes the Ouija Board work, and work it does. As I have read and listened to many a former occultist describe his or her entry into the world of Satan, they testify in most cases of having begun their descent by participating in the Ouija Board . Even though this "game" is purchased in most toy stores, it is not a game, it is active witchcraft. Do not be deceived. Any attempt to foresee or foretell the future is also called "divination". God has strong warnings against Divination. Notice in this verse that God reveals that one of the reasons He is destroying the nations which occupied the Promised Land before Israel was because they practiced Divination and other forms of Witchcraft, using Witches and wizards as mediums. Yet, here in America today, exactly that kind of Witchcraft is being taught to our children as normal and fun! God's judgment upon America is set; only the timing remains unknown. Changing Into Animals and Back Into Human -- such a transformation is possible, but exceedingly rare. The power behind this phenomena is wholly Satanic and is only possible at the very highest levels of Witchcraft. From the beginning of our discussion of Harry Potter books, we said that for Harry to have achieved the Sorcerer's Stone , he has to have achieved the highest level of Witchcraft possible. Therefore, your children are learning the most sophisticated, highest-level Witchcraft in existence! The way in which a Witch becomes more powerful, and advances through the various degrees, is to invite into herself or himself multiple possessing spirits. The more powerful the demonic spirits within a witch, and the more varied they are in type and ability, the more versatile, and powerful, that witch will be. In fact, a witch powerful enough to change herself, or someone else, into an animal, is a witch that has as many demons possessing her -- or him -- as that poor soul in the New Testament known as Legion . THIS is the only type of demon possession that makes it possible for a person to change himself or someone else into an animal and back. They must be possessed of many, many multiple demons. "PHOENIX -- No bird is so rare or difficult to find as the Arabian phoenix. It feeds on frankincense, and its feathers are used in many kinds of spells ... Ashes from a phoenix that has died of natural causes may be rubbed on a wound ... to promote miraculous regeneration." Now, let us learn the real truth about the Phoenix Bird. 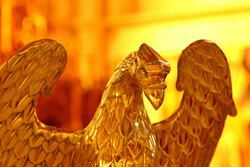 The Phoenix Bird originated from Ancient Egyptian Mythology. Listen to the explanation from Masonic author, Manly P. Hall, 33 Degree, K.T., in his book, "The Phoenix: An Illustrated Review of Occultism and Philosophy ". [Before we begin, I find it highly interesting that Hall would admit, by his use of this title, that Freemasonry is occultic]. Let us stop right here to examine Satan's counterfeit "Born Again" experience. Freemasons, as do all occultists, refer to their initiates who have completed their initiation, as being "Born Again". I will never forget 1988, when George Bush was on the Presidential Campaign Trail; he was being interviewed by Barbara Walters, and she posed him a question which evidently caught him off guard. Walters asked Bush if he was a Christian. Bush visibly faltered, cast his eyes down for a moment, and then answered, "If by being a Christian, you ask if I am 'Born Again', then yes, I am a Christian". I came straight out of my chair because no truly Born Again Christian would have parsed their words so carefully. However, an occultist, which Bush certainly was by virtue of his life-long membership in the Illuminist Masonic secret society of Skull & Bones, would have answered precisely this way. Occultists claim to be Born Again , and they are filled with religious ecstasy when the spirit of Lucifer sweeps through them upon Initiation. Now, let us return to our discussion of this Phoenix Bird. Listen to the explanation given by a radical feminist, Barbara Walker, in her occult book, Now Is The Dawning , p. 281. Egyptians believed that the Phoenix was the representative of a god who "rose to heaven in the form of a morning star, like Lucifer, after his fire-immolation of death and rebirth ..."
Wow! In one sweet, short, and simple sentence, we have conclusive proof that the Phoenix bird is a symbol of Lucifer ! Listen now to the testimony of another former witch, William Schnoebelen, in his book, Satan's Door Revisited , p. 4. "The Phoenix, of Bunnu is believed to be a divine bird going back to Egypt ... This Phoenix destroys itself in flames and then rises from the ashes. Most occultists believe that the Phoenix is a symbol of Lucifer who was cast down in flames and who ... will one day rise triumphant. This [belief] also relates to the raising of Hiram Abiff, the Masonic 'christ'." To prevent most people from associating the Masonic Eagle with the ancient Phoenix, Freemasons changed the Phoenix to an Eagle, and began to refer to it as an Eagle. However, two Masonic authors blow the lid off that change in symbolism. In one sentence, we see the admission that the Phoenix Bird of Ancient Satanic Egypt was changed into the Masonic Eagle and then Pike's admits that the Eagle is the Symbol of the Sun God and of the God of Mendes, both symbols being common Satanic symbols of Satan/Lucifer ! In the final stages of their plan for a New World Order, Illuminized Masons picture the Phoenix Bird as the ultimate symbol of their coming Masonic Christ, the Antichrist. Therefore, this book preconditions children to accept the Phoenix unreservedly! The author of this book warns his young witches and wizards not to get caught up in the hype of the fascinating aspects of Alchemy. He correctly lists the following facts about the occult practice known as Alchemy. "Alchemy involves studying natural materials to try and discover two main things -- the Elixir of Life, a tonic that supposedly gives perfect health and prevents the aging of the body and the Philosopher's Stone, a material that, mixed with a metal such as lead, is supposed to leach out impurities and produce gold. " The "inner truth" is quite different. Let us examine what Alchemy is, and why it is important to the practicing Satanist. The New Age Dictionary defines Alchemy as a "quest for the secrets of life by the transmutation of base metals into gold in the West; by discovering the Elixir of Life in the East." This author also states that alchemical references to "sulphur", "mercury", and "other chemical elements" leads one to the search for the Philosopher's Stone [Page 16], which is also known as the Sorcerer's Stone. This latter revelation is exceedingly important, because Rowling's second book was called "Harry Potter and the Sorcerer's Stone". 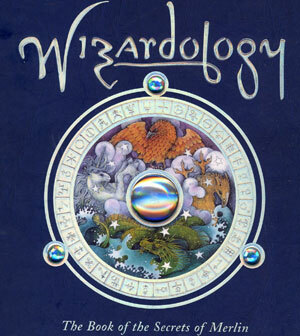 In this book, a quest is begun to discover the Sorcerer's Stone, out of which comes the "Elixir of Life". In Chapter 13 of the Potter book, "Sorcerer's Stone", we learn that Professor Dumbledore -- Headmaster of Hogwart's School of Wizardry and Witchcraft -- had a long term relationship with another sorcerer, Nicolas Flamel, who had perfected the Elixir of Life through the process of Alchemy [Sorcerer's Stone, Page 219]. Thus, Flamel had achieved the Sorcerer's Stone, and is depicted as having original possession of it Then, in the next few paragraphs, we learn that this Sorcerer's Stone possessed by Flamel produced the Elixir of Life, the drinking of which would "make the drinker immortal" [The Sorcerer's Stone , Page 220]. Finally, we learn that Flamel was 666 years old when he achieved the Sorcerer's Stone and had first partaken of the Elixir of Life! [Ibid.] Thus, Rowling correctly ties in the number of Antichrist with Alchemy and its pursuit of occult eternal life, a very strong indication that she is a practitioner of the Luciferian arts. Alchemy is not really the turning of base metals into gold but is the path the occultist takes to achieve eternal life through Magick! And, the Philosopher's Stone is really the ultimate goal of the Alchemist, which is to stage the coming occult Christ. In summary, this book is very dangerous because it is aimed at children and is designed to take away any objection to the practice of the occult by making it appear innocent and fun. And, the fact that you can buy it in the children's department of a toy store makes the book and its hellish contents seem quite innocent. That is the problem. Satan understands the maxim that what one generation tolerates, the next generation embraces. America has been heading toward a serious practice of Witchcraft for the past three decades, ever since Rock Music turned to Heavy Metal. Now, we are seeing one of the end results, i.e., a book of real Witchcraft aimed directly at children. Truly, we are heading of the End of the Age, the time when the greatest practitioner of Witchcraft the world has ever seen arises on to the world scene -- Antichrist. Books like this one will have prepared the way.